How to draft a Business Invitation Rejection Letter? 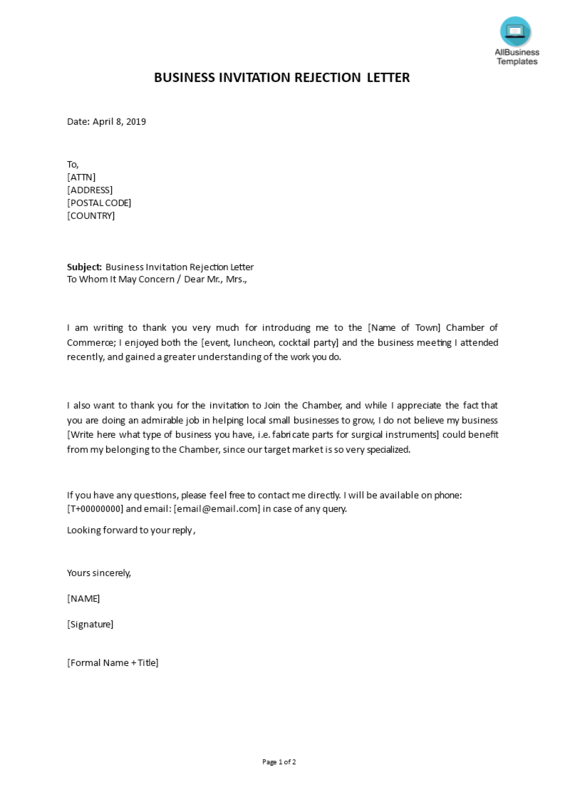 An easy way to start completing your document is to download this Business Invitation Rejection Letter in Word template now! Instead, we provide this standardized Business Invitation Rejection Letter in Word template with text and formatting as a starting point to help professionalize the way you are working. Our private, business and legal document templates are regularly screened by professionals. If time or quality is of the essence, this ready-made template can help you to save time and to focus on the topics that really matter! Download this Business Invitation Rejection Letter in Word template now for your own benefit! I am writing to thank you very much for introducing me to the [Name of Town] Chamber of Commerce; I enjoyed both the [event, luncheon, cocktail party] and the business meeting I attended recently, and gained a greater understanding of the work you do..